correct the registry entries that point to them. Internet Explorer menus and toolbars*. * Some user basic knowledge of the Windows® registry is advisable. I suggest caution with a program such as this. Generally, registries don't need so-called fixes and you may do more harm than any good. ..... Generally, registries don't need so-called fixes and you may do more harm than any good. Comrade Professor, your recommendations are not very reasonable. The program was again not fixed in the new version. The registry does not take pictures even in the free version. Link from the first post has been tested in a PC with i3, Windows 10 x86. Not just the about window, but runing fine and it fix all registry. Not just the about window, but runing fine and it fix all registry. I write that the program does not take pictures. Look carefully at the picture above. This is the developers did not fix the problem. I installed the Build 2581 on top of Build 2580 -> Applied Patch-RmK-FreE and all works as it should. Great job @remek002 ! 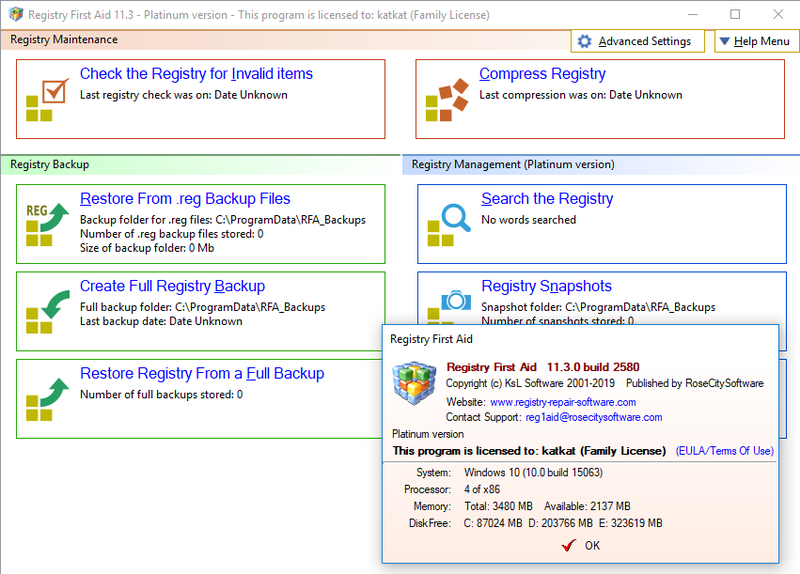 Registry First Aid v11.3.0 Build 2585 is out! We know this, but what's going on? The rest part of your post has been lost. Do you also know how much has downloaded from the original link? True, this link is also posted almost 24 hours before You posted. Second thread closed until someone posts a separate update..